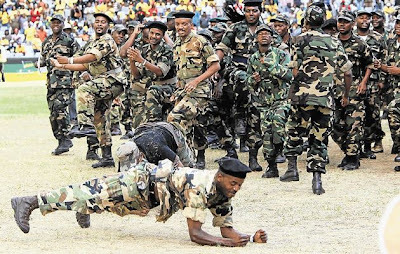 Cape Report: Cosatu: "Guerrilla military skills of MK needed on ground"
Cosatu: "Guerrilla military skills of MK needed on ground"
I think it is important that right from the onset I clarify some of the basic things about COSATU, the African National Congress and MK. Firstly, we come to address this congress not as friends of the ANC, but as strategic revolutionary allies who shared, and continue to share, the trenches of war against colonialism of a Special Type with the ANC. Secondly, we did not and continue not to participate in this struggle simply as beneficiaries but as part of the South African working class whose hard conditions of life compelled them to be at the forefront amongst the ranks of the Congress Movement to attain the National Democratic Revolution vision. We know that we are the most organised detachment of the working class and therefore we subject ourselves to the revolutionary discipline of the working class as a whole, which is the conscious and uncompromising leading detachment of the motive forces of our revolution as led by the ANC. We know that the working class has the responsibility of uniting the widest range of classes and social strata in a common struggle for the realisation of the strategic objectives of the National Democratic Revolution. The history of our revolution bears testimony to the facts that you are our own. It was not a mistake that amongst the members of the Luthuli Detachment who participated in the Wankie Spolilo operation, which was the first MK group...were amongst the first to receive military training in the Soviet Union. The 1978 Politico-Military Commissions Report contained what was later to be popularly referred as the Green Book said that "the armed struggle must be based on, and grow out of, mass political support and it must eventually involve all our people. All military activities must at every stage be guided by and determined by the need to generate political mobilization, organization and resistance, with the aim of progressively weakening the enemy's grip on his reins of political, economic, social and military power, by a combination of political and military action." As COSATU, we later saw comrades testifying in the Truth and Reconciliation Commission [TRC] on their roles as commanders of the MK units. Amongst those many units was the called "Operation Butterfly Unit". Amongst those...who testified that the limpet mines which exploded on 27th September 1985 at OK Bazaars, and Game in Durban West Street, were directed at the dispute between unions and management which was refusing to accede to workers demands. Sasol had become a symbol of South African independence. It was South Africa's answer to the oil embargo and through those struggles, the apartheid project was disrupted. History will show that MK targeted and bombed SASOL twice. We want to challenge the MKMVA to make their project to detail the historical facts which must demonstrate the organic relationship between MK activities and trade union struggles. Actually, you must consider having a joint political education project with COSATU on this matter. The history of our revolution must be written by those with first- hand experience and MKMVA must lead that process. What we have seen and continue to see happening in the mining sector is not without its own historical, political and economic basis. And any genuine revolutionary, who is genuine about freedom, will not use those platforms to attack the movement but use them to deepen class war against the class enemy which are the employers. The fact of the matter is that workers of this country are paid less as compared to the wealth they produce and also incomes of their bosses. We want to warn those who continue to kill our people, and those who continue to insult the leadership of our movement and setting up units to destabilize and weaken the NUM: Our patience is not endless! We will soon be calling on our people to defend themselves. Comrade, Chris Hani taught us that it is those, who knows how to fight, who will be the first to call for peace. We've got to have MKMVA members using their guerrilla military skills to work with us on the ground to defend this movement and our revolution as a whole which is being threatened by demagogues, who are seeking political survival by all means and at all costs, even at the cost of the very revolution they claim to advance. We are coming from our 11th National Congress drawing inspiration from the recommendations of the ANC policy conference which called for radical second phase of our transition. We are now preparing for the ANC 53rd Conference to be held in Mangaung and we are going there to argue that the radical phase of the second phase of our transition will require the programme of the movement must be clearly biased towards the working class. And also that it must be based on an agreed platform which is implemented by government; that we deliberately build an activist interventionist state and that the ANC-led Alliance should constitutes the strategic centre of power which directs the National Democratic Revolution [NDR]. And the ANC shall always reflect this dominant character without underplaying the other class interests. In our view comrades, there can be no radical second phase of transition if the ANC does not prepare to generate a programmes that are driven and supported by the masses. It is actually the ANC's adherence to the mass line which took us to the 1994 breakthrough, albeit with the emergence of alien tendencies which began to emerge during the negotiations in which the masses began to be treated as secondary. The period we are going through and the period of the radical second phase of our transition will require the political commissars and real commanders must practically occupy the front ranks of our revolution. We want practical answers from the MKMVA!